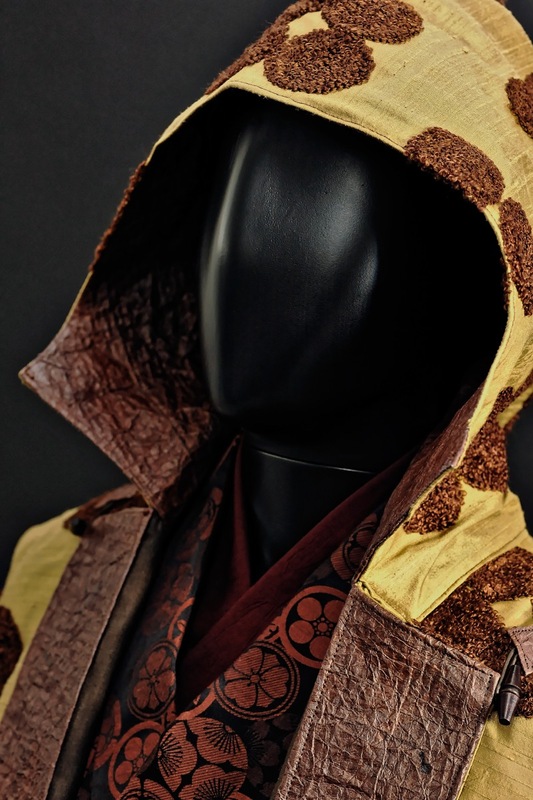 Be a present day samurai with these Armor Hoodies. What started as a crowd funding project has turned into an overnight success..
Ninjas seem to be all the rage, ninja shoes, ninja trousers and ninja turtles…leaving the original Japanese swordsmen, the samurai, kind of left behind in their modern day fashion presence. Sure, the complex samurai armor isn’t easy as to integrate in nowadays fashion as the simpler Ninja outfit and a little over the top designing would make you look like an extra in Beat Takeshi movie. Well get your wallets out, because Samurai Armor Hoodies has released these awesome hoodies, turning you into a 2016 samurai without looking tacky. Ninja kneel for your master! Tokyo Otaku Mode, is taking pre-orders for Samurai Armor Hoodies right now. $350 gets you a hoodie in black, red, or white, plus your choice of tatemono helmet ornament and mask. If you can’t bring yourself to pick just one tatemono and mask combination, additional crests can be order for $30, and masks for $20. The entire lineup can be ordered here directly from Tokyo Otaku Mode between now and May 20, with shipping scheduled for August. 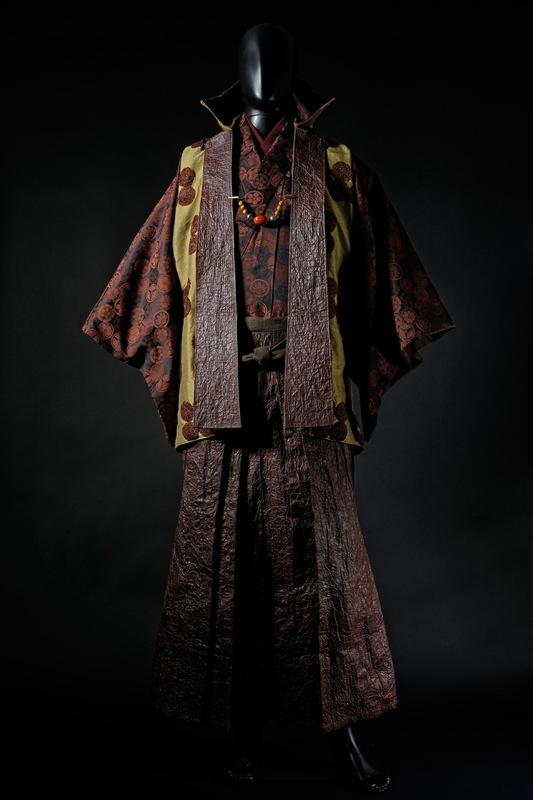 Artful craftsmen create men’s kimono using unconventional materials, with astounding results. 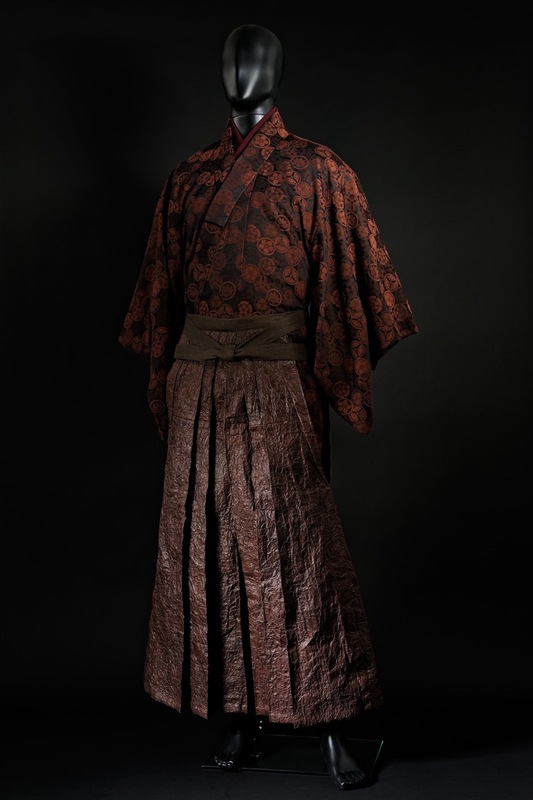 Kyoto-based fashion label Wazigen Shizukuya is celebrating its 10th anniversary with a new line named opus 9, giving us some new unorthodox kimono, leaving the traditional silk behind and using paper (!?) instead…..
Wrong image my friend, although I had the same image when I read the headline of their press release, but upon further reading things became clear..the paper they used is called kamico, which is paper treated with starch and rubbed and wrinkled until it is soft and flexible, this started as early as in the 14th century, which is a really long time ago. 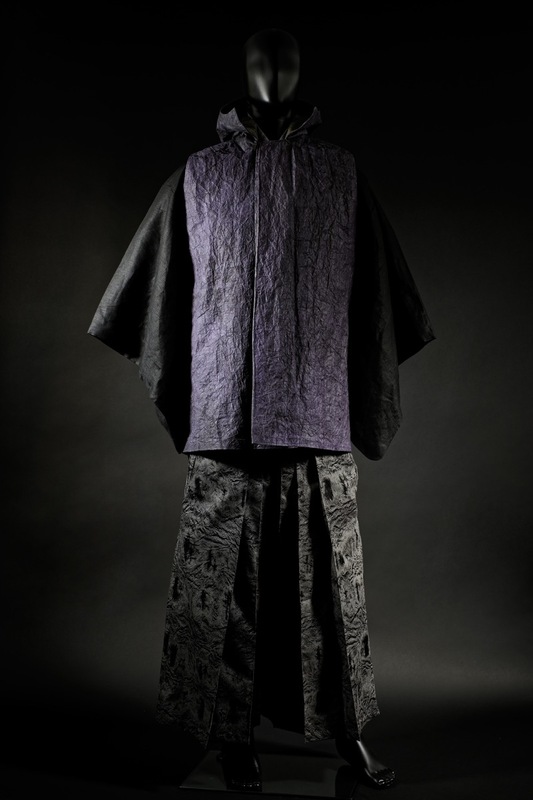 The first folks who wore clothes made out of this material were Buddhist priests who used it as robes and underwear, than later by the poor(ish) people as clothes and bedding because it was cheap….well due to inflation and some other things it has become a rather pricey product in our time and age. Nowadays kamico is still created the same way but the paper is sewn with hemp yarn and cotton yarn for extra strength. A great disadvantage though is that these clothes aren’t washable which would upset your wife or mother, but they can withstand the rain, (not typhoons) and if due to a case of extreme clumsiness you tear it, you can repair it with kamico! Each product is carefully hand- made and the attention to detail is astonishing , they haven’t only focused on the looks but also on the wear-ability. These are custom made for one year only and therefore very exclusive. Yamanashi Prefecture is perhaps most famous for its beautiful scenery – which of course includes Mt. Fuji – but the prefecture is also home to a number of traditional crafts. One technique in particular, called “koshu-inden,” has been widely praised. 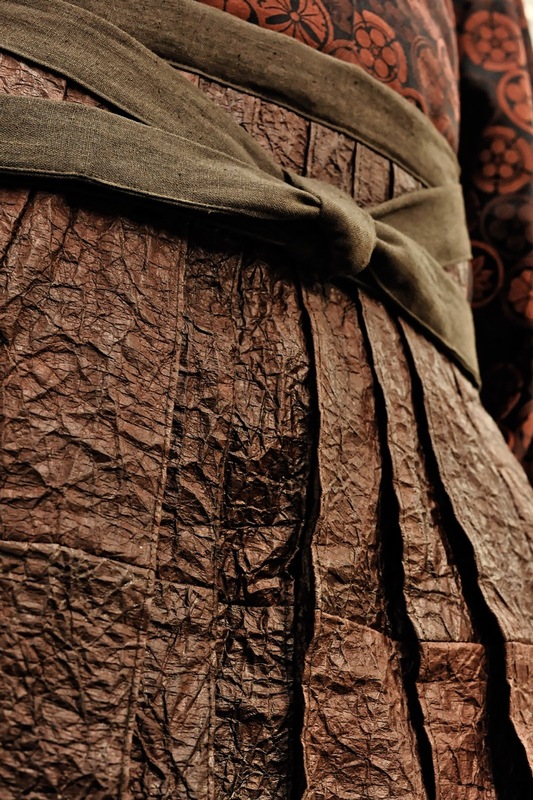 Pioneered by a company established in the 16th century, this leather-working art was once used to decorate samurai armor and is considered by some as emblematic of samurai bravery. 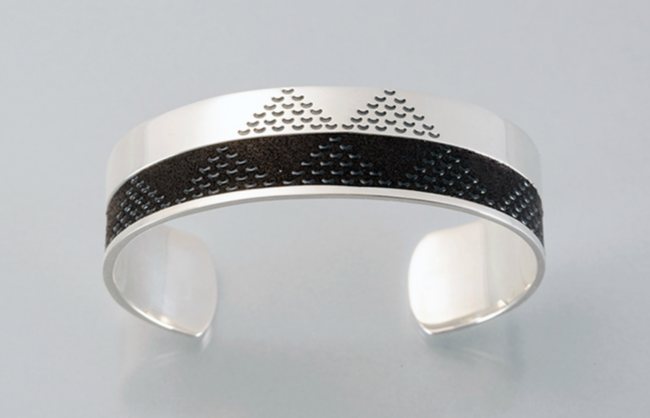 Now, you too can wear accessories bearing this symbolic design and crafted by that legendary company thanks to a collaboration that has produced a number of beautiful bracelets. Check out some of the items below. Established in 1582, Inden-ya was the first to develop as secret technique using lacquer with deerskin to create a special leather with a strong luster. Using the nami uroko design, the triangles composed of dots like fish scales above, Inden-ya’s creations were often used to decorate samurai armor during the Warring States Period. Recently, Inden-ya started a collaboration with the Japanese accessory brand Kagayaka to create a line of items using the nami uroko pattern called Yoroi. 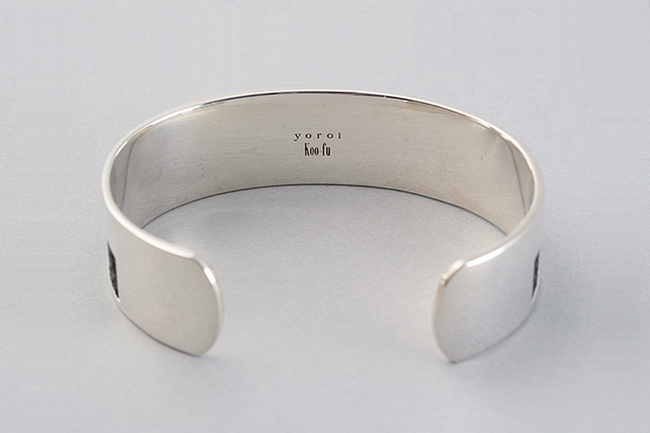 Of course, “yoroi” is the Japanese word for armor, and this line is meant to evoke the image of samurai bravery. Perhaps the most striking item in the line is the “Wide Plain,” which is made of silver and the inden deerskin leather, both bearing the nami uroko design. 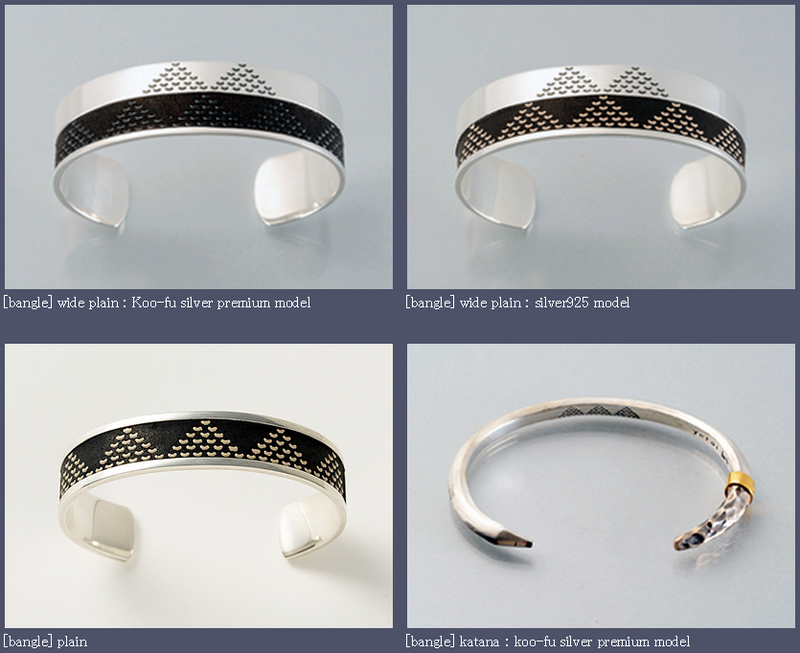 But beauty comes a price — and one of these bangles will set you back up to 66,960 yen (about US$540). 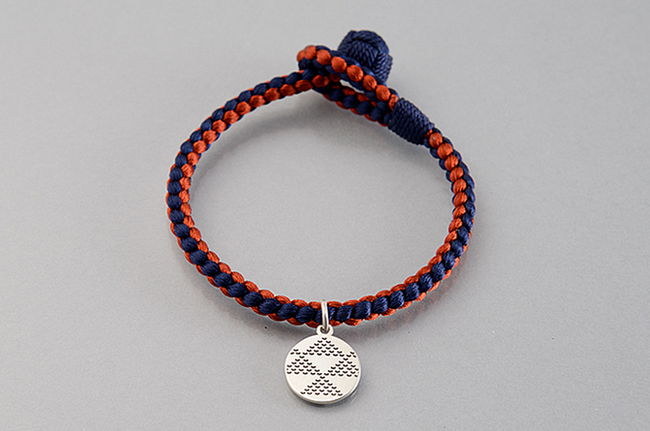 If you’d like to bolster your bravery for a slightly lower price, the line also includes the Kumihimo charm. 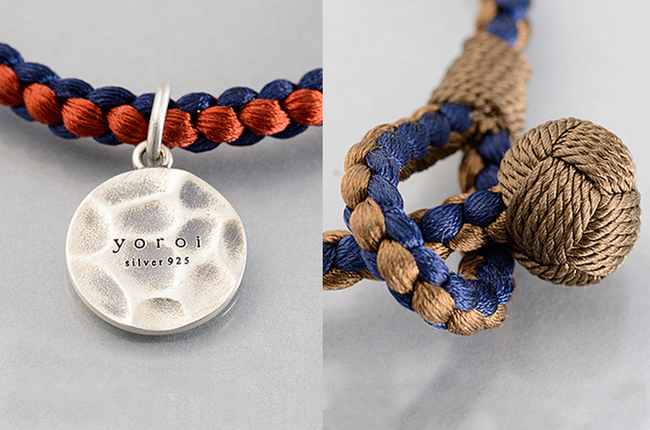 With rope made by the Kyoto-based company Showen Kumihimo, the charm features a silver medallion with the nami uroko design on the back. 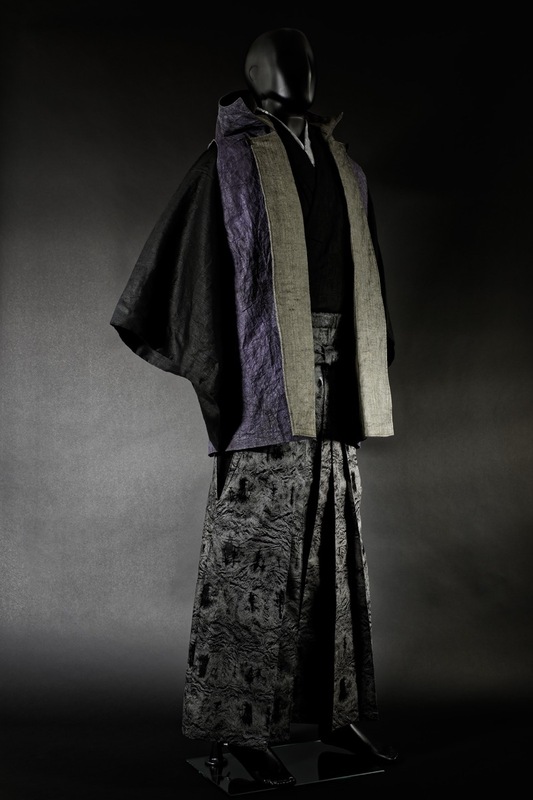 The rope was inspired by odoshige, roped used to tie together pieces of armor by samurai leaders. It was meant to both beautify the armor and magnify the dignity of the wearer. 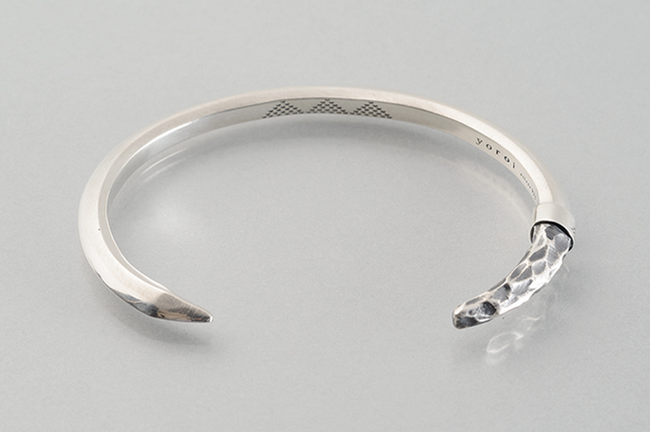 The line also includes another bangle item called Katana, named after the japanese sword, obviously. The nami uroko design is etched into the interior of the band, which is made of silver and clearly resembles the sword that inspired it. 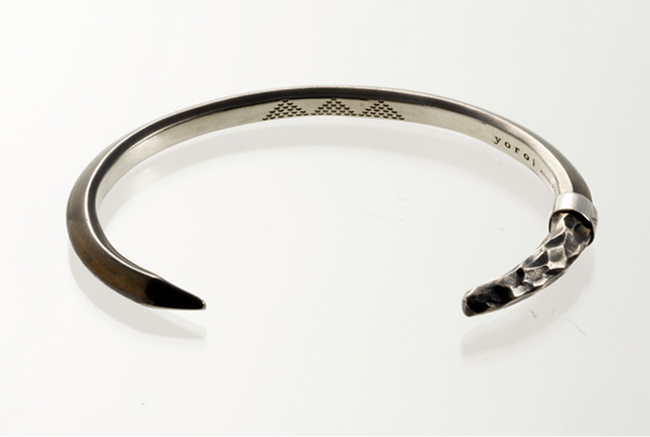 Perhaps the least showy piece of the line, the Katana bracelets come in a number of different materials, including silver, premium silver, and ibushi (oxidized silver, shown above). The Kanata ranges up to 63,720 yen (about $512), depending on the material. Inden-yan originates from Koshu, an area with a number of long-lived traditions. You can see a few of them in the video below. You can also learn more about the company and their techniques on Cool Japan Press. To find a list of shops offering these (and other) items, head over to Kagayaka’s website or to purchase online check out Wabist.